LAEL PARROTT IS AN EXPERT at striking a balance. A Professor of Earth and Environmental Sciences at UBC’s Okanagan campus, she recognizes that compromise is necessary for progress. Her goal is lofty—to solve “wicked” environmental problems—but her means are modest and realistic. She embarked on a path of studying agricultural engineering, and then specialized in ecological engineering. When Parrott started her studies, she realized there wasn’t much information about ecosystem design. New ecosystem design begins with a blank slate similar to a child’s sandbox project: soil, water, plants, and animals are added sequentially. Distinct from child’s play though is the complexity of ensuring an engineered ecosystem is functional and lasting. Parrott is developing new quantitative tools and computational models that take into account the complexity of real ecosystems and landscapes. These models are then used to inform environmental management and conservation organizations. Called complex systems management, this approach involves the input from many areas of research including geography, ecology, engineering, biology and economics, to name a few. “By working together our whole is greater than the sum of the parts,” says Parrott, who collaborates with individuals from all of these fields. One project was centred in the St. Lawrence estuary. The waterway is an essential foraging ground for migratory whales and a mating area for the critically endangered beluga whale. The St. Lawrence also supports a whale-watching industry, and is a main thoroughfare for large shipping vessels. Parrott was asked to consult on how to best equalize the demand for water space both for the seafarers and the behemoths of the sea. Parrott collaborated with Parks Canada and Canada’s Fisheries and Oceans to generate quantitative support to help with the decision-making process, including the pros and cons of different management actions. In the end, compromises were reached: the whale-watching industry agreed to new regulations and the shipping trade agreed to voluntary reductions in speed limits for vessels. The whales, of course, decided to stay and display their aquatic prowess. “In order to find sustainable solutions, conciliations like this are necessary,” says Parrott. Living in BC has exactly the right combination for Parrott, who incorporates the outdoor environment in and out of class. The ever-environmentally conscious professor also bikes to work. The benefit of having a car-free commute is obvious for Parrott, who enjoys the thrill of cruising past the local traffic. The move to UBC Okanagan is helping to fulfil Parrott’s conservation goal. Compromise is especially relevant in the Okanagan Valley, where there is a balance between meeting land development pressures, maintaining the agricultural land base, and supporting the natural ecosystems essential for quality of life and well-being. Parrott terms these as “wicked” problems in which there is no single resolution that satisfies the involved parties. 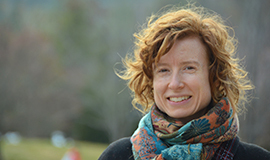 She works extensively with urban, government, and environmental planners and ecologists to seek sustainable solutions. She works collaboratively with non-academic partners and it is a huge benefit for the students. Why Earth and Environmental Sciences? 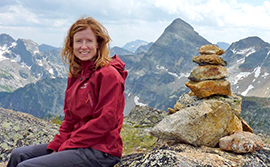 Parrott has also been instrumental in the formation of the Okanagan Institute for Biodiversity, Resilience, and Ecosystem Services (BRAES), which she currently directs. BRAES is a consortium of UBC Okanagan faculty members, graduate and post-doctoral students, collaborators, and partner organizations that works together to advance research and teaching in conservation and ecology. In collaboration with more than 50 partner organizations, including government ministries and non-government organizations, the goal of BRAES is to increase scientific understanding of ecological systems from genetics to landscape scales and to inform management and planning decisions that promote environmental sustainability. The institute’s strength is its multidisciplinary focus, with members from biology, mathematics and statistics, earth and environmental sciences, physical geography, economy, and creative arts departments. BRAES partnerships within the University and with government, non-government, community, and international organizations include activities such as joint research, funding agreements, student supervision, dissemination or application of research.